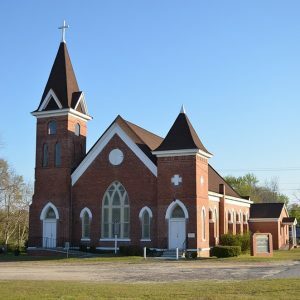 This church, founded soon after the Civil War, held its first services in a brush arbor in the Woods community of what was then Barnwell County. It built its first permanent church, a frame building, in the Zion Branch community near Old Allendale, and adopted the name Zion Branch Baptist Church. The church bought this site in 1875, built a new frame sanctuary here, and was renamed Happy Home Baptist Church.